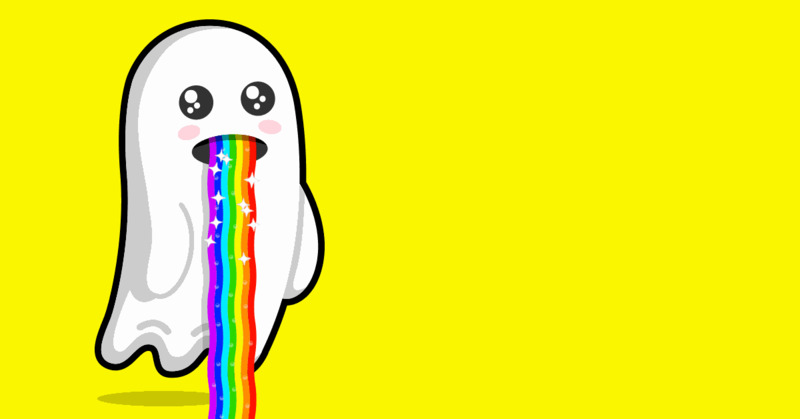 If you're a Snapchat employee, 'Facebook' is probably fast becoming a dirty word. For months now, any story involving both names has inevitably been about Facebook lifting yet another one of Snapchat's features. It's happened so many times now it's starting to feel like some kind of bizarre joke. In truth, it's just Facebook sacrificing the sanctity of their image in the name of maintaining their growth rate. They couldn't care less about whether or not people think they're rip-off artists if it means they can keep pulling in more users, especially young ones. It's working, too. Even WhatsApp's 'Status' feature, the least accessible of Facebook's four (four!?) clones of Stories just reached 175 million daily active users. That's more than Snapchat has full stop. Meanwhile, Instagram Stories and Messenger Day continue to balloon in popularity, leaving only the native Facebook version as the anomalous failed experiment. The Snapchat crew must be pretty depressed about this. In fact, Evan Spiegel recently gave his staff a motivational talk, in which he told them to focus on one very important thing, which further studies have now backed up - Facebook are beating them on numbers, but they are beating Facebook in engagement. According to this new report, released by App Annie, it goes further than that. In the US, some 35% of Snapchat's users don't use Facebook on a daily basis. That's just the tip of the iceberg though. 58% of Snapchat users who use Messenger don't use it on any given day and 93% of them don't use WhatsApp every day. 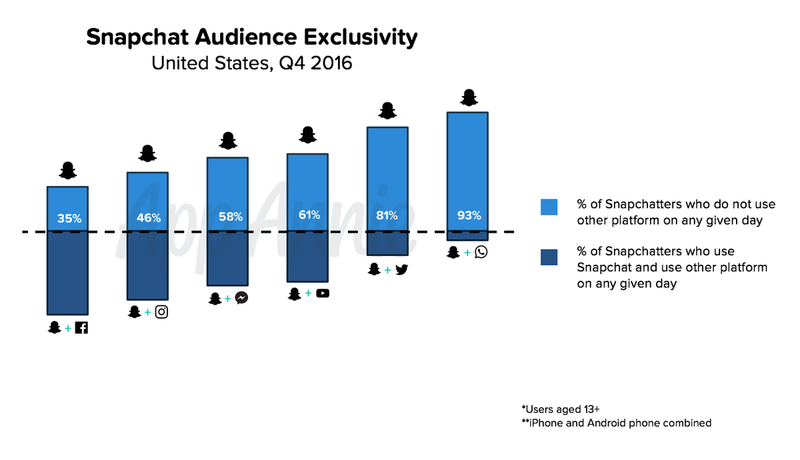 Snapchat, it would seem, are leading the charge in daily usage, at least in the United States. The key thing to bear in mind here is that while Facebook have to share a large chunk of their audience with Snapchat, Snapchat have a significant contingent of users who aren't bothered about Facebook. 10,000 users who log on for five minutes a week are far less valuable than 100 users who log on for one hour a day. Here's another thing to bear in mind - it made Facebook panic. Mere hours after App Annie released their report, Facebook published their Q1 earnings report for 2017, which claimed that 66% of their monthly active users visit the site every day. There's something oddly satisfying about watching the largest social media company in the world squirm like a jealous child watching their sibling beat their high score on Street Fighter. Knowing that two thirds of Facebook's monthly active users are daily visitors isn't as valuable to advertisers as knowing that so many of Snapchat's users favour the app above all the others. It shows them that Snapchat are offering them something they can't get anywhere else, regardless of how much of their content Facebook paste into their platforms. Snapchat's biggest problem is their contention in the stock market, which can't be remedied by user engagement, only user growth. While growth is far more difficult to maintain, Snap have been developing the app imaginatively and consistently for years now and have showed no signs of slowing down since the IPO launch a few months ago. This battle isn't lost yet.